Inkscape is most easily customizable through the Preferenze di Inkscape dialog (File → Preferenze di Inkscape... (Shift+Ctrl+P)). There are too many options in the dialog to cover here. It is worthwhile to scan through the options under each entry. The most important options have already been mentioned in the text. They include: Setting the Rotation snap angle and other scaling parameters under the Step entry. Determining if transformations should be Optimized or Preserved under the Transforms entry. Setting the Default export resolution under the Misc entry. 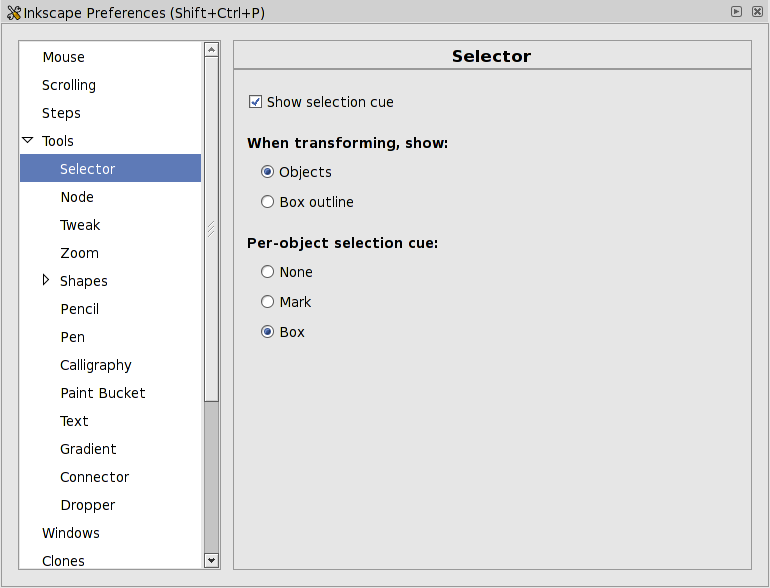 All the preference are stored in the file .inkscape/preferences.xml. There are quite a few preferences, some undocumented, that are accessible only by hand editing this file. See the next section for some of these.